SF of renovated area. The project also included site utility work required to relocate and re-connect to existing services. This included relocation of the facility’s electrical service. Electrical design included site lighting and emergency generator. 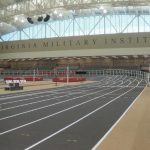 Our firm provided engineering design services for this State-of-Art Indoor Training Facility. The project is scheduled for LEED Certification. 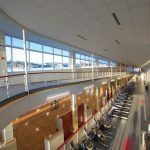 Dunlap and Partners provided mechanical, electrical, plumbing and fire protection design services for a new 110,000 SF student fitness/wellness center. The project is targeted for LEED NC 2.2 Gold. Dunlap & Partners provided design for the renovation of an existing 77,000 SF athletic facility to upgrade it to NCAA Division I standards. 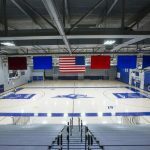 In addition to the basketball arena, the facility contains a natatorium, locker rooms, weight rooms, dance studio, kinesiology lab, and various classrooms and office spaces. Dunlap & Partners provided M/E/P/FP design for the Wytheville Community Center. The 100,000 SF facility contains a two-court gymnasium, an elevated running track, aerobics and fitness rooms, a large assembly room with partitioning for three smaller spaces, a pre-function lobby, three additional breakout meeting rooms, a catering kitchen, four adult activity rooms, one youth activity room with 2-story climbing wall, a child care center, a 6-lane, 25-meter swimming pool and a separate therapy pool. 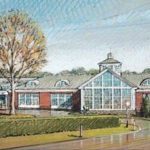 Our firm provided M/E pre-planning design for a new 120,000 SF fitness center with basketball courts, ten racquetball courts, weight room, aerobic facilities and natatorium. 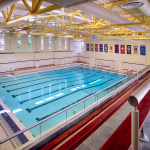 Our engineers provided M/E/P design for a new 10,000 SF facility with swimming pool and locker rooms. 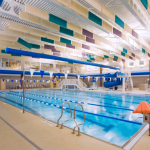 Our firm provided M/E/P/FP design for this new 70,000 GSF athletic center. 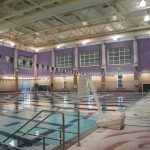 Primary programming included public spaces, administrative spaces, weight and fitness room, multi-purpose room, locker rooms, support facilities, gymnasium and natatorium. Dunlap & Partners Engineers provided M/E/FP for this three-phase project. 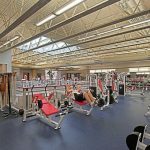 Phase I included a new 32,000 SF Athletic and Fitness Center, with 5,500 SF of administrative and public space, and approximately 26,500 SF of activity space including a weight and fitness room, wrestling room, a multipurpose room, and a training/wellness room. Phase II was the renovation of the 24,000 SF Scott Gymnasium. 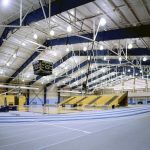 Phase III was the demolition of the existing field house and construction of a new 53,000 SF Field House, which hosts basketball, indoor track practice and competitions (200m track), and tennis. 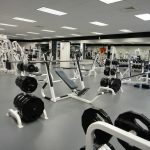 A planning study was provided for the renovation and HVAC improvements to two fitness facilities. 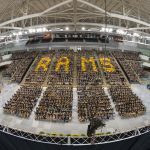 Our engineers provided mechanical and electrical pre-planning design for a new 160,000 SF university convocation center. Dunlap & Partners provided M/E/P design for the renovation of the existing activities gym to Fitness Center and addition of three court gymnasium. This also included renovation of the basement in the existing Robins Center.